This week marks the start of the school year for most kids. Their alarms will go off a little early (or for the first time since last school year ended) and they’ll be donning their new wardrobe or freshly pressed uniform. Before they head out the door with a new back pack full of sharpened pencils and unused crayons, give them a special treat to commemorate their new year. Sift together flour, salt and sugar into a large bowl. Add to food processor with butter and process until the mixture resembles coarse crumbs. With processor still running, add ice water one tablespoon at a time until mixture comes together into a ball of dough. Remove and separate into two balls and wrap tightly with plastic wrap; refrigerate for one hour. In the meantime preheat oven to 350 degrees Fahrenheit and whisk together brown sugar, confectioners’ sugar and cinnamon. On a lightly floured surface roll one ball into a rectangle at least 10” x 12”; cut into 9 smaller rectangles, each measuring 3” x 3.5” and place on a baking sheet sprayed with non-stick spray or lined with a non-stick mat. Place 1 tablespoon of brown sugar mixture in center of each rectangle. Repeat rolling, measuring, and cutting process with second ball of dough. 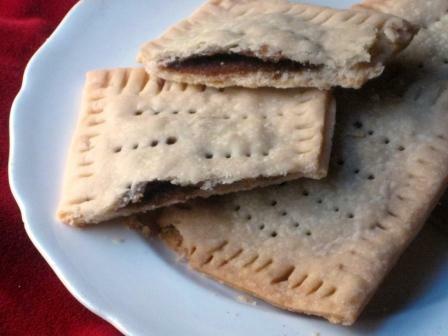 Place rectangles firmly over ones on baking sheet and firmly press the edges down with a fork. Gently poke four or five series of holes in the top of each pastry. Place in oven for 25 minutes, turning halfway midway through. Cool on sheet on baking rack. Food processor dough is the way to go when making baked goods. It takes very little time to come together and avoids a big, floury mess in your kitchen. Even after an hour of refrigeration the dough is extremely workable, almost to the point that it requires some care during the rolling process. The brown sugar and cinnamon mixture melts in the center of each pastry during the baking process as the dough turns golden brown. Once baked, each breakfast treat is crispy and resembles the original, only better. Other combinations work well in the center, too, like Nutella and preserves. If you do decide to use the latter, make sure to be conservative with the amount placed in the center; too much and it could ooze out of the pastry, making a big mess. Though not entirely healthy, the homemade breakfast pastries would be a great start to a first day of school. They’re even good enough to be a great surprise treat for an after-school snack. With the endless combination of fillings, you can please even your pickiest child and potentially steer them away from the breakfast treat aisle, once and for all.